The Humanity, Utility and far reaching Effects of Grip Strength. If you intend to move the world, you will have to begin by grasping ahold of it. If you want to make good on those intentions, you best not let go. As humans we are creatures seemingly ever seeking to leverage ourselves further, higher, beyond from where we stand. We thrive on engaging ever evolving challenges, and the many ways in which we go about achieving this are vast. Although our feet ground us to the earth, and language binds us with others, it is our hands that have the unique ability to both bind us with our environment as well as allow us to mold it according to our intentions. In fact, beyond bi-pedalism, our hands are considered one of the main factors that first gave us such distinct advantage over other species (1). One of the main advantages of our unique hands are their incredible versatility. They can perform some of the more precise fine motor movements known to humanity, as seen in the works of surgeons, sculpters, artists and musicians. So complex are the minute motions of ones hands that they are recognized as a significant part of non-verbal communication (2, 3) across cultures, as many of us have learn in both pleasant and unpleasant ways. Subtle changes can shift a motion from welcoming to malevolent. At the same time our hands are capable of great force and violence; whether ripping an object apart or in the form of a fist hardened to stone to strike. Of the many functions capable of a hand the one this article will focus on is grip strength. This is the uniting feature of many impressive feats of physical challenge. Whether it is free climbing a sheer mountain side, ripping a phone book in half, or lifting an enormous amount of weight from the ground, a pair hands is always present holding the person to the goal. Statistics are a funny thing. As much as they should often be taken with a grain of salt (for correlation does not equal causation), there very often are insights to be gleaned from them. In particular statics about mortality risk carry a certain gravity about them that any reasonable human being would take caution to consider. It is well established and generally understood to the public that smoking, a low quality diet, and a lack of physical activity all contribute to poor health and an increased likelihood of death (4). Other factors such as high blood pressure (5) and depression also appear to be highly predictive of mortality (6), although the latter may not be as well appreciated in our culture. What is likely less well known, but also well established as predictive of overall mortality risk is ones grip strength (7, 8, 9, 10). Meaning; the weaker ones grip is the more likely you are to die sooner than later. If you are going to hold onto this world you seem to first need hands capable of doing so. Poor grip strength has been shown to be correlated with not only all-cause mortality (9), cardiovascular death and cardiovascular disease, but it has also been shown to be a to be a stronger predictor of cardiovascular mortality than even high blood pressure (7). When further studied it was found muscle size and body composition did not explain these differences (10); grip strength is a stand alone factor for the robustness of ones health. Why this is still is not well understood scientifically (8), but intuitively most all of us would understand how our ability to grasp ahold of the world is related to our vitality within it. Almost as if ones grip strength is related to our will to live, or at least our wanting to live while alive. With that, there is no closer a function related to ones will to live and thrive than ones breath, and in fact, there appears to be a connection between ones respiratory health/capacity and grip strength/capacity. It has been shown that grip strength is directly correlated to ones respiratory muscle strength both in healthy and unhealthy members of the population (11, 12, 13). A pair of strong lungs are accompanied by a pair of strong hands. This correlation goes deeper though, as the linkage of grip strength to other capacities is not simply limited to ones lungs. Ones grip strength has also shown to be highly associated with the strength of other limbs, and ones overall total muscle strength (14). The capacities of your hands and the rest of ones body are intertwined. This makes sense in that both a strong grip and body as a whole are likely attained and maintained by the exact same things; you cannot attain one without pursuing the other. Now when one considers all these things, a great appreciation of the integrated machine we all inhabit arises. In this way we could look at grip strength as a body wide ability. Not merely a physical ability isolated to the hands, gripping is a full body action that requires a mind with intent behind it. Both the reality and the application of this will be delved into further on. Our hands are not only capable of many far ranging feats of action, but they are also an incredibly sensitive appendage. In fact, our brain is hardwired to both sense and engage the world quite heavily via our hands themselves. 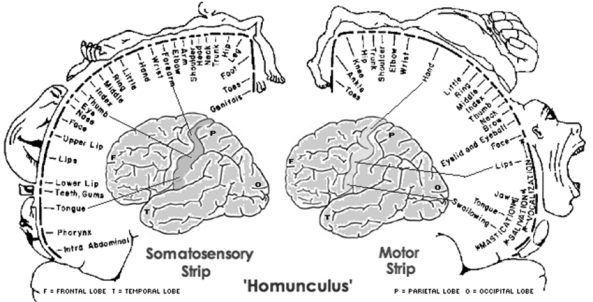 This is excellently observed and appreciated when one veiws the pictorial and model description of the sensory and motor distribution of human body within the brain, known as the Cortical Homunculus. The size of the body parts are proportional to the density and volume of innervation in the motor and sensory portions of our cortex. As seen in the picture below, there is a notably large sensory and motor component to our face and hands. In many ways, this gives us a good idea of how we humans are preset to sense and engage the world. At times a picture is worth a thousand words, and a physical model can add even greater depth of understanding. Below are two models depicting our motor and sensory homunculus, held at the London Natural History Museum. Here the significance of ones hands in the way we sense and engage the world becomes immensely clear. In some ways it is common sense that our hands are such vital parts of our sensing selves. When individuals experience one sense failing them, it is well documented that the remaining other senses increase in their acuity to compensate (15). In the situation where one becomes or is blind, ones hands then become their feeling eyes. As a result one can learn to see an individual by feeling their face, can learn to read by feeling brail, and can perceive the immediate world through the use of a cane to sense the changes in terrain. In many ways our hands are an extension of our eyes, as anyone can appreciate when fishing through a pocket for a specific elusive object, or feeling a wall while moving in a dark hallway. Without seeing, and with only feeling, one can perceive quite well. With those significant portions of our brains dedicated to innervating our hands, it is not surprising that our grip does not act in isolation, but in unison with the entire body. Studies have shown repeatedly that as one increases the contraction of their grip, muscles in the shoulder girdle engage in an equally increasing fashion (16, 17, 18). This is more notable in elevated arm positions than with ones hand and elbow by their side (16), but still present throughout all ranges. This linkage of muscular activity is most significant in the stabilizing muscles of our shoulder girdle, the rotator cuff (16, 17). Functionally this allows the shoulder to grip the body as the arm grips the world, leaving the other muscles free to move the limb and trunk. Now this reactive gripping of the shoulder as one grasps the world is seemingly not just in response to the activity, but in anticipation of it as well. By simply reach forward with your shoulder girdle and holding it (protracting ones shoulder) as one would reaching forward with their hand (or should), it has been shown that grip strength for a short period afterwards is increased (19). This same study demonstrated that with this simple movement the muscles that stabilize the scapula (serratus anterior in particular) increased in their activity, and this increase was directly correlated with an increase in grip strength. By design, as our hand grips the world, our shoulder more firmly grips onto us, making the two inseparably linked. In fact the link between grip and shoulder strength has been recognized as so significant it has been proposed that grip strength alone could be used to assess the capacity of ones rotator cuff (20). Now this connection between grip and shoulder strength was further examined by a study that looked at the effects of a training program aimed solely on conditioning scapular and trunk stability, while measuring if this resulted in changes in grip strength (21). Participants were asked to perform several exercises challenging trunk and shoulder stabilization in varying weight bearing positions over the course of six weeks, while compared to a control group who did no training for that period. Of note; none of the exercises required gripping of any sort, and only one required significant weight bearing on their hands. Despite no actual gripping activity being performed, after the course of six weeks hand strength (as measured in a variety of gripping tests) was significantly improved, but only in the group that perform the stabilization training (21). Truly, we cannot consider a part of us without considering the whole. As the hand holds the world, the shoulder must hold onto the scapula, the scapula onto the body, and the body into the world. This must all work together in ever adjusting harmony, and incredibly it very often does. Of course if you just sat and watched any capable human being move one would recognize this beautiful interconnected flow that is movement, these studies just confirm what has been long observed. Nonetheless, we should be grateful for the ability of modern science to quantify and tease out these amazing qualities. Now this unity of producing tension is not limited to ones upper half. Studies have shown that both contracting and actively relaxing muscles in ones foot has direct effects in the cortical excitability of ones hands (22). Meaning; as the foot relaxes the hand in turn cannot contract as hard, and as the foot tenses the hand can contract more effectively. There are places in our body that if we increase tension, it will radiate throughout the rest of our being. Jaws are one, our breath another and our grip a third. This has been put to great use, in that it has been shown that by simply creating tension in our grip (28), or jaw (29, 30), ones balance reactions stiffen. Clenching and forcefully gripping ones hands when in a challenging or fearful situations is something anyone climbing up or down a difficult mountain exquisitely experiences. With exposure to challenge and difficulty; tension will increase to keep us upright. Unfortunately this tension can become a problem, in that it can severely limit us. At times individuals can be stuck in their grip; with no trouble creating tension, their challenge lies in letting the grip go. It is harder to tense one part of out body and leave another relaxed, as this requires a higher level of co-ordination. This is well observed in a baby learning to walk, and the degradation of movement capacity with the deconditioned, the neurologically injured and the elderly. Movement is largely reflexive, but effective athleticism is able to grasp, tense, and release. As necessary, and only as necessary. All this of course makes a great deal of sense. If your hands connect you to the objects of the earth (to have, hold and move), then the body must be attuned to respond in synchrony with them. A train can only pull the cars it is firmly attached to. But then one would ask, how should we go about grasping the world to give us the best advantage? Like most things, the answer is not cut and dry. Because our hands are such complex and dextrous things, it goes without saying that there is simply no one way in which to grip the world. The objects and tasks we find ourselves undertaking with them in this life are endlessly varying, and thus our ability to adjust our grasp must be was well. Despite this, we can divide types of grip into a few general categories. It has been proposed that one of our major evolutionary advantages is our ability to grip and wield tools, and in particular weapons (1). It has been proposed that as our distant ancestors began to walk upright, our hand became freed for use beyond transportation. With shorter and thicker fingers capable of wrapping around to meet a more muscular and prominent thumb, the human hand is capable of grasping and handling a variety of objects both with precision and power, unlike any other species on Earth (1). This is proposed to have allowed our distant ancestors to pick up, aim and wield a variety of objects to both defend and attack, creating a notable advantage for survival, and thus steadily passing on these unique traits to the subsequent generations. The specificity and capacity of the distinct human hand has been studied and described at length by the paleoanthropologist and physician John Napier (23, 24). Napier proposed that humans have two fundamental handgrips, each designed for two distinct tasks; the precision grip used for throwing objects, and the power grip used for hold objects for clubbing. The latter is used when an object is gripped in a way to allow for an accurate release at a high velocity, and the former when the object needs to be held onto as the full body whips force through it. Only the human hand allows for grasping objects with such power and accuracy, combined with our unique ability to stand upright to drive force from our legs through the arm to the hand. Thankfully, we live now in comparatively peaceful times, rarely being required to defend ourselves with a weapon. The typical physical demands of our day consist of hard and/or repetitive labor (for the minority of use regularly exposed to it), and the demands we place on ourselves via exercise habits. From this, four distinct forms of gripping for the purpose of heavy/repetitive lifting and strength training can be described. Pinch Grip: The name describes it well. This is best used when grasping small or narrow objects where full hand closure is not possible (think grabbing the side of the door; not the handle, the door). The thumb is heavily involved with whatever fingers are incorporated. Open Grip: This is best used when grasping large and/or flat objects where one has to spread out ones hand to make an effective purchase. Closure of the hand is not possible, and instead a broad surface area must be engaged. This is typical when lifting stones, boxes, bags and anything of size and mass that has nothing that can easily be otherwise grasped. Climbers will often need to take on versions of this grip depending on the available surfaces they are engaging. Fingers may be open or closed depending on the object grasped and need to create effective purchase. Traditional Closed Grip: This is what we typically will take on with traditional strength training where an object can be easily grasped. It is best used when one can fully close their hand around an object, as in the case of holding handles or straps (or in the case of strength training barbells, kettle bells, dumbbells, etc). It is such a comfortable and effective grip that we as a species have created a vast assortment of technology to aide us in attaining it while grasping objects. This is seen in all the varying forms of handles and straps (all perfectly designed to fit and fill the average human hand) attached to the many objects in our modern lives. At times it will be advantageous to have the thumb left out and grip predominantly with the fingers. This creates a hook-like tension to the hand. At other times it will be highly necessary to incorporate the muscular human thumb in the grip in order to effective attain and maintain purchase. This creates a squeeze/crush leverage for the hand. Hook Grip: A technique used in power lifting and weight lifting in order to maximize ones grip strength. This is done via wrapping ones index and middle finger around the thumb, effectively trapping the thumb against the bar. The result is a notable increase in leverage and grip strength in situations where a bar is being lifted from the floor, due to the entrapment of the thumb acting as a wedge. The limitations to this grip lies only in the increased time for set up and limited carry over to daily life. It is rare that one would find themselves actually grasping an object this way unless they are looking to lift a large amount of weight on a barbell. This article will focus more on traditional closed grip, since it has the greatest carryover to the varying demands of strength training and ultimately the varying demands of life. That is not to say that the other three forms of gripping are of lesser quality; they have their merits and depending on ones persuits may indeed be worth integrating into their regular practice. Training ones grip to improve its strength and effectiveness is fairly straight forward, but actually attaining a strong grasp in of itself does require attention to detail for some. There is a tendency for many to habitually (often unconsciously) avoid engaging their 4th and 5th digits when grasping objects, favoring their thumb, index and ring fingers. While one may have the initial reaction of thinking its only the loss of two fingers, one of them in particular seemingly meager, it does have a very real detrimental effect on ones grip strength potential. In fact, it has been shown that eliminating the 5th digit from gripping results in an average decrease of 33% in strength (25), and further removing both the 5th and 4th digit resulted in a 54% decrease in grip strength (25). This revelation would not be surprising to individuals who partake in regular strength persuits (for they have always known the hand is best used fully), but it does fly in the face of previous scientific assumptions. Previous research had mistakenly looked individually at the contributions of fingers to grip strength, estimating the little finger to contribute only 15% to ones gripping strength (26, 27). The flaw in the modern scientific method is that in the search to understand, there is an attempt to place controls on situations and create divisions in order to better understand it all. Unfortunately, there is no guarantee that the divisions studied are the way things truly are. Like many of the myopic mistakes of science, this previous research overlooked that that neither our fingers nor the arm attached act in isolation, and thus cannot be measured as such. Regardless, the take home message is simple; grip with your whole hand, with all of your fingers for the greatest possibility of strength. The concept of grip at times must be felt body wide with strenuous activity. The vast majority of our movements are reflexive, with us merely intervening as we choose and are able to in order to do what we aim or please to. We must learn to have a prepatory body wide reaction to allow one to effectively grip ahold of whatever their situation is. When our hands grip an object our arms must in turn grip the body, our abdomin grip our torso in place, and our feet grip the ground they stand upon. Only then will grounding be given to ones grip, and from there leverage harnessed. No matter how strong the lever is, it is only made useful when wedged securely. This bodily interdependence is seen in the relationship between steadying the shoulder on the body, and the measurable strength of ones grasp (16, 17, 18, 19, 20). This is further appreciated when one observes that shoulder strength and endurance is related to trunk and core strength and endurance (21). Indeed, just like the function of the hand is greater than the total of its fingers, our body itself is greater than the summation of its parts. The hand needs grounding from the arm and trunk, just as much as the arm and trunk need the hand to grasp the world firmly. With all this kept in mind, one should approach grip training not as an isolated act of the hand, but as a focused activity training the arms to hold onto the body as a whole as the grip works to maintain its grasp. The following are three general examples of exercise groupings that can be used to challenge and cultivate grip strength, all while synchronizing it with the grounding of ones arms to ones body. Hanging Based Movements: Literally this is supporting ones bodyweight via a bar or any other apparatus and holding on for a duration. These include Deadhangs, Pull ups, Chin ups, Leg raises and Levers in all their variations. Unfortunately in these situations the feedback is obvious and urgent; one will fall if their grip fails. Like the previous two activities, linkage of ones arms and grounding of ones torso (despite being un-grounded) must be considered in order to both give ones grip leverage, as well as train movement habits that are durable. Again, these are only three general examples of manners in which one can formally take on cultivating strength and endurance in their ability to grip the world firmly. There are many other forms of training ones grip strength, but they typically come back to a similar theme; grabbing ahold of something that is difficult and persevering. As is often stated in, and is back up by a mountain of research, one gets what ones trains (see HERE). Thus it is often better to keep it simple, and variations light, in order to maintain focus on ones goal. In order to become good at holding on to and moving the world, one must master this skill through practice. In order to keep this skill, one must never stop practicing it. Realistically, if one was to consider what ones grip strength truly means, it is likely an output and example of their life lived. Perhaps it is just that folks who happen to have a strong grip also happen to have cultivated a strong body. Thus grip strength is nothing more than a result of physical ability, not an agent of causation. Perhaps those that lack a strong grip have poor general strength and/or health because they either never did, or failed to continue, the necessary work to attain and maintain a physical life of vitality. Ones hands are an incredible thing, and their unique ability to grasp, create and manipulate is a significant part of what sets us apart from other species. Although the skill of strength may appear to be more natural to some, it is nonetheless exactly that: a skill. As a result it can be taught, learned and mastered by most everyone. With few exceptions, and like most things, with intention and training likely all of us can procure a pair of capable hands. For the sake of ones effectiveness, durability and resilience in this life, cultivation of the ability to grasp ahold and keep ahold both as needed and as intended is priceless. Posted in Physical therapy, Strength and conditioning. Previous Post Training attention; taming and aiming the mind.